Russian olive (Elaeagnus angustifolia) is a Eurasian tree originally introduced to North America as an ornamental plant. The tree is considered a desirable component of planted windbreaks in some semi-arid environments in the West. Since its introduction, Russian olive has spread from intentional plantings and invaded many riparian areas where it dominates the plant community causing serious ecological changes. Potential losses include wildlife, agriculture, and recreation. Managing Russian olive trees includes mechanical cutting, mowing or shredding followed by herbicide treatments. Application timing for cut stump or modified cut stump herbicide applications with Vastlan® specialty herbicide is immediately following mechanical removal. 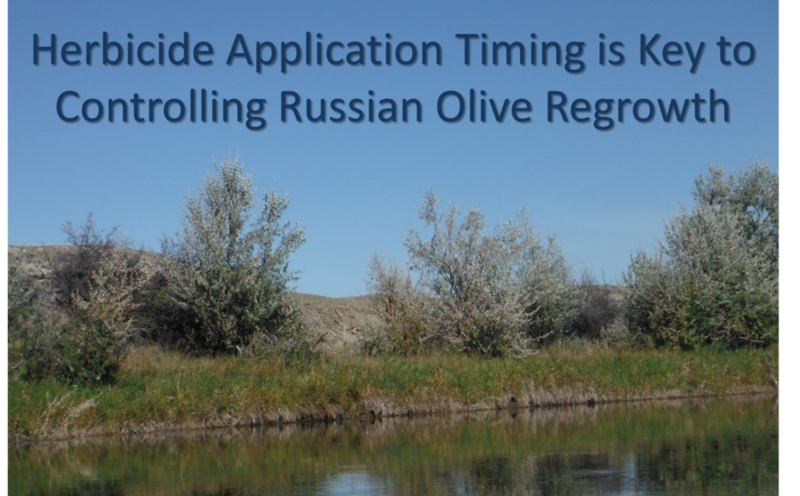 Garlon® 4 Ultra specialty herbicide has a wider application timing window, but must be applied prior to re-sprouting (See Saltcedar and Russian Olive Management). If herbicide treatments are not applied during this timing window, Russian olive will regrow quickly from non-treated stumps. Identify the most cost- effective treatment (Wyoming location). This article describes the results from these studies. Russian olive trees were mechanically removed in February using a mulcher mounted on a skid steer (Figure 1). Herbicide treatments were applied to Russian olive regrowth either in July or October (Table 1). Height of Russian olive regrowth was 2 to 4 feet in July and 3 to 8 feet in October. Treatments were applied in a randomized complete block design with three replications. Plots were visually evaluated for percent control in June and October . Russian olive trees were clipped to ground level in the spring to simulate a mechanical cutting operation and allowed to regrow through summer months. Herbicide treatments were applied over the top of regrowth in September (Figure 2). Treatment plots were arranged as a randomized complete block design with three replications. Plots were visually evaluated for percent control nine months following treatment (June). Figure 1. Mulcher removing top growth of Russian olive trees in Wyoming. Photo by Mary Halstvedt. Table 1. 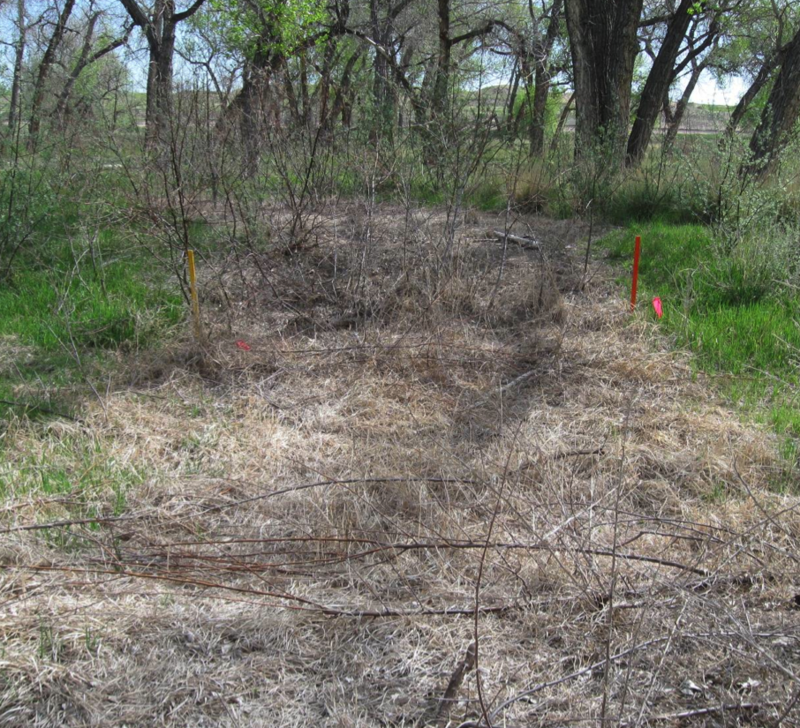 Herbicide, application rate, and date of application to Russian olive regrowth following mechanical removal in Big Horn County, Wyoming and Henry, Nebraska. Results of the studies show that height of Russian olive regrowth at time of treatment is an important factor influencing control. In Wyoming, herbicides applied in July to 2 to 4 foot regrowth provided significantly less control than similar treatments applied in October to 3 to 8 foot regrowth (Figure 3). Garlon 4 Ultra at 3 and 4 quarts per acre (qt/A) and Garlon 4 Ultra at 2 qt/A plus Milestone® at 7 fluid ounces per acre (fl oz/A) applied in fall provided more than 90 percent control of Russian olive regrowth one year after treatment (1 YAT). The addition of Milestone at 7 fl oz/A to Garlon 4 Ultra at 2 qt/A provided significantly greater Russian olive control (97%) compared to Garlon 4 Ultra at 2 qt/A alone (66%). Based on conclusions from the Wyoming study, the most cost effective and efficacious treatment was Garlon 4 Ultra at 2 qt/A plus Milestone at 7 fl oz/A applied in fall. Figure 3. Percent control of Russian olive treated with Garlon 4 Ultra alone or with Milestone in Wyoming one year after treatment. Results were similar in Nebraska nine months following treatment. 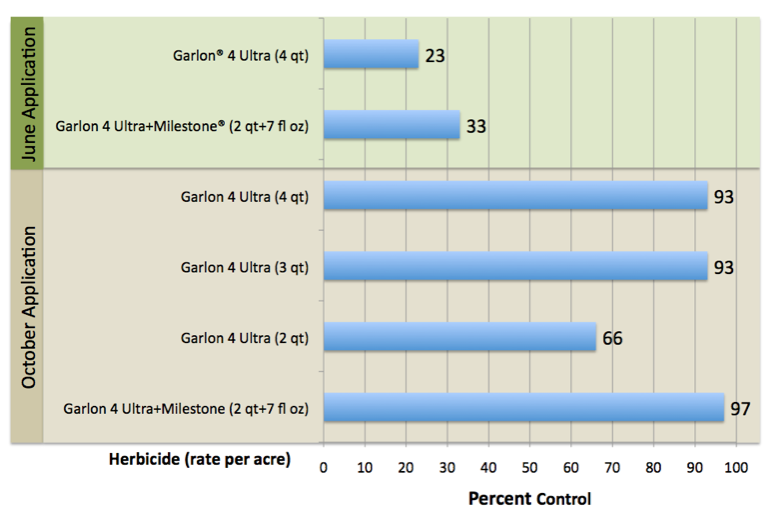 Garlon 4 Ultra (3 qt/A) plus Milestone (7 fl oz/A) provided 98 percent control compared to the same rate of Garlon 4 Ultra alone at 50 percent control. Russian olive control with Garlon 4 Ultra plus Milestone herbicide provided similar Russian olive control as imazapyr (Nebraska location) nine months after treatment. However, grass injury ranged from 50 to 85 percent with imazapyr treatments compared to 0 to 5 percent grass injury with Garlon 4 Ultra plus Milestone (Figure 4 and 5). Figure 4. Desirable grass injury ranged from 50 to 85 percent with imazapyr treatments (left) compared to 0 to 5 percent grass injury with Garlon® 4 Ultra plus Milestone® (right) in Nebraska nine months after treatment. Photos by Mary Halstvedt. Figure 5. 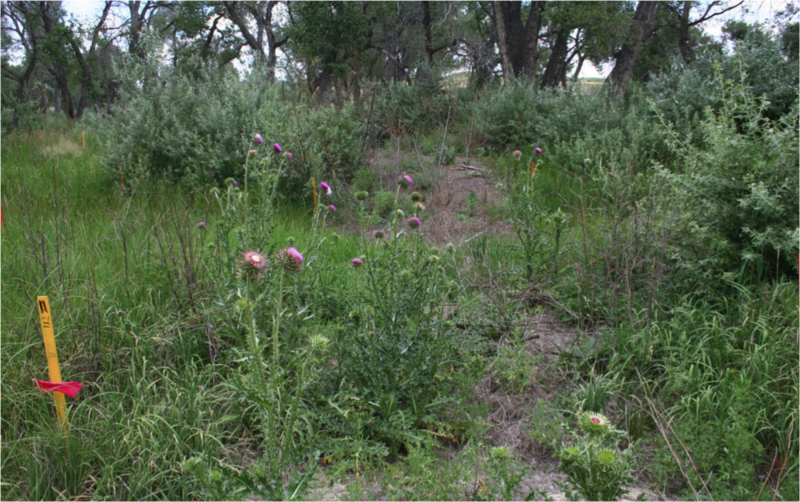 Biennial thistles and other weedy species established in imazapyr-treated plots the year after treatment in Nebraska. Photo by Mary Halstvedt. Herbicide treatments to Russian olive regrowth must be delayed until regrowth is at least 3 to 4 feet in height (six months or more following cutting/mowing) to achieve acceptable control. This allows time for plants to develop adequate leaf area for more herbicide uptake from a foliar application. It may be necessary to delay the application until the year after cutting, or at least until late summer or fall following a cutting/mowing event the previous winter or spring. The addition of Milestone at 7 fl oz/A to Garlon 4 Ultra at 2 qt/A increased Russian olive control and was the most cost effective treatment. The addition of Milestone also provides excellent control of invasive broadleaf plants such as perennial and biennial thistles present on the treated site without significant injury to desirable grasses. Richards R, MB Halstvedt, TD Whitson. 2010. Russian olive control in Big Horn County, Wyoming. In: Proceedings Western Society of Weed Science. V63:p44. Sleugh B, M Halstvedt, C Cummings, V Peterson, RG Wilson. 2010. Saltcedar and Russian olive control with aminopyralid containing herbicide treatments. In: Proceedings Western Society of Weed Science. V63: p43. State restrictions on the sale and use of Garlon 4 Ultra specialty herbicide apply. Consult the label before purchase or use for full details. Milestone and Vastlan specialty herbicides are not registered for sale or use in all states. Contact your state pesticide regulatory agency to determine if a product is registered for sale or use in your state. Milestone specialty herbicide: When treating areas in and around roadside or utility rights-of-way that are or will be grazed, hayed or planted to forage, important label precautions apply regarding harvesting hay from treated sites, using manure from animals grazing on treated areas or rotating the treated area to sensitive crops. Consult the label before purchase or use for full details. Always read and follow label directions.